However, he’s unlikely to change the world stuck inside the orphanage walls, under the watchful eye of the director Dieudonné Ngoulmoumako (and the various relatives doing his dirty work), so when the chance comes to make a break for it, he’s happy to take a risk and opt for a life in the real world. This is his attempt at giving literary life to the underdog and bringing attention to the itinerant players in the big city. This is true not only for the main character, but also for the supporting cast of street kids, prostitutes and orphans. Petit Piment is very much a story of two parts. The first, set in the orphanage, begins with the happy days spent practicing songs with the Reverend Papa Moupelo and shooting the breeze with his friend Bonaventure. A shift comes, though, when the director decides to enforce socialism on his helpless charges – with Papa gone, there’ll be no more songs and dancing. Life becomes a little tougher, but our young friend knows how to fend for himself, taking revenge on the bullying twins for their attacks on Bonaventure in a manner that ensures his name stands out. The second half of the novel sees our young friend set loose in the big city, one of a gang of kids stealing at the market (and surviving on a rather unusual diet…). However, Petit Piment is lucky enough to escape this life, at least in part, when he falls in with a local ‘madam’ and her girls, receiving affection and a safe haven. With the addition of a job and a little cabin, life’s looking up until, sadly, it all falls apart when politics interferes in the life taking place on the streets. This mistrust is echoed all round the country, with each helping their own, yet there are still many examples of altruism, with people like the inimitable Maman Fiat 500 going out of their way to help our young hero. 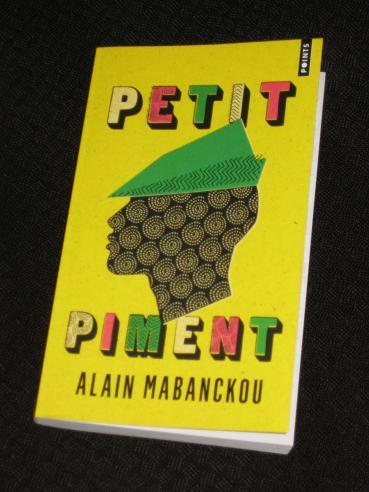 Funny, and touching at times, Petit Piment is an entertaining story that eventually comes full circle, a short journey taken the long way round. A slice of life from a place most of us have never visited (and are unlikely to either), it provides a welcome contrast to some of the more serious titles on the longlist, without ever forgetting that life is a serious matter (even if the best way to deal with it is to keep smiling…). As much as I liked it, I’d have to say no. One issue I have is that it takes half the book for him to leave the orphanage, leading to a rather unbalanced novel (a couple of years versus decades). Also, while it’s entertaining enough, is there really that much to it? I’d say not. It’s fun to read, but I can’t say that it’ll stay in my memory for very long. Broken Glass was filled, as your review noted, with many clever literary allusions. I recall from my reading things like someone accused of abusing his children responding “Do you see me nipping buds, shooting at a child” after the Kenzaburo Oe novel, and Broken Glass lamenting how he is approaching “my final autumn as a patriach (Garcia Marquez). Paul – It’s a long time since I wrote that 😉 No, not that I recognised, anyway. Some clever humour at times, but nothing literary (of course, I may have just missed it all…). I remember largely missing it in Broken Glass and having to go back through to spot some references. But it did elevate that book from comic novel to something more literary. I loved Mabanckou’s Memoirs of a Porcupine (review at mine), but this sounds weaker. Less balanced as you say. I note David liked it more at his which is promising, but since I haven’t read Broken Glass yet this will be further down the pile for me I’d say. I’d saved this review because our Book Club had Petit Piment on this year’s reading list. I agree with your review. It’s a nice enough read but not a major work of literature. Didn’t you find the ending rushed and strange compared to the rest? The orphanage part was good, the second part was weaker and the ending was terrible, as if he was rushed by deadlines. Emma – Yes, absolutely. As I mention in my post, for all its good points, it’s a fairly unbalanced work, with what should have been the first third or even quarter of the book actually accounting for half the novel!